Welcome to the 50th episode!! 50! that's so cool! I'm chatting about three new patterns this week - use the code GODDESS and receive a 15% discount till the end of the weekend. The offer is available if you buy 1, 2 or all 3 patterns. Pull Pearl over your jeans and voila! you've got relaxed elegance. Pearl is a pretty sweater that's going to make you feel gorgeous and feminine, whether you're curled up with a book or heading out for coffee. The A-line body and three-quarter length sleeves are flattering and easy to wear, and the simple lace panel and i-cord neck-line give a really special finish. Blurry eyed, you slip out of bed, wrap your hands around a steaming cup of coffee and, stepping outside, raise your eyes to the east. Slowly, gently, the new day begins. Pull your shawl closer around your shoulders and hold on to the remnants of warmth from your bed. A golden glow teases the landscape and whispers of hope. This is Flindra, a celebration of the magical moment as night meets day and darkness is filled with light. Knitted from side to side, Flindra is an escape into delicious texture. 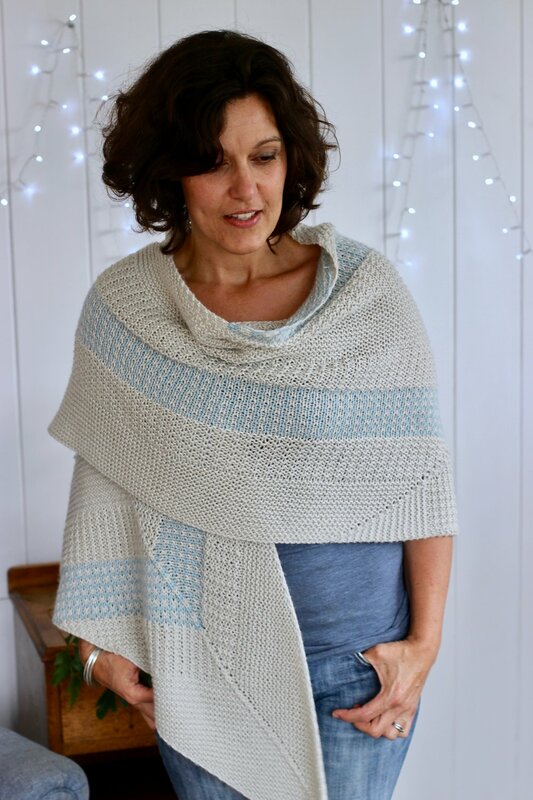 You’ll relax to the rhythm of simple stitches, subtle colour play and delightful shifts in direction with easy increases and decreases. The pattern includes written and charted instructions plus links to tutorials, and is perfectly suited to experienced knitters and adventurous beginners. Hemera is the hat you’ll reach for time and time again. She’s graceful with a nod to fun and she’ll keep your head toasty on the coldest of days. Featuring all over lace and texture, Hemera is quick and postively addictive to knit. The winding stitches are quick to master and the oversized lace intuitive to follow. Add a fluffy pom pom for a splash of cute or enjoy the stunning crown detail without. Knitted from the bottom up and in the round, Hemera is perfect for experienced knitters and beginners looking for a challenge. The pattern includes written and charted instructions, plus links to tutorials that make knitting new stitches a breeze. All three patterns use a brand new DK yarn from Outlaw Yarn - Nyx. It's a delicious blend of Polwarth and Silk and this weekend you can buy it online and in store at Edie & Co. Fancy joining a knit along? Pop over to the Outlaw Yarn facebook group for more details! To enter: leave me a comment below and tell me about you and gauge swatching. Do you? If not, have I convinced you? What tips can you add for a new swatcher? Entries close 9am Friday 10th March (NZ time). Winners will be announced on the next podcast. Stay tuned!